VehicleManagerOnline is a online Fleet Management system which allows you to cost-effectively manage your vehicle assets, accidents, driver, vehicle costs and performance from a simple user interface. We offer three variants of the system to suit your requirements including a FREE version. The more advanced system allows for as many vehicles as required and can be administered by various people within your organisation. At a time when the cost of driving is never far from the headlines maximum cost efficiency is critical to all. Every penny counts and this is where VehicleManagerOnline can save your company money and improve your vehicle management. The VehicleManagerOnline tool is simple to use just load the Fuel Usage, Cost of the Fuel and the odometer reading in Kilometres or Miles each time you purchase fuel and this will start the analysis of the costs and performance. The analysis reporting tool includes many views such as vehicle economy, price of fuel, monthly and yearly costs and performance and plenty more. We provide three versions of the VehicleManagerOnline system, please take a look at the table to the right. Click on a feature title if you would like to have more detail. 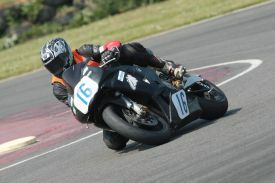 Follow Paul from 2-WheelRacing is in his Rookie season. He is currently competing in the Thunderbikes Class. Paul is currently putting together a website so you will be able to keep upto date with his progress through the season. Please click on a Feature below to understand more. We offer a vehicle tracking solution which is integrated to work with one of our vehiclemanageronline user interfaces. Below is a selection of Fuel Prices from around the world. The data was loaded into our databases by our memebers. Please find a link to our Leaflet describing the VehicleManagerOnline features. The Standard and Standard+ See How It Works option has the Driver Feature switched on. This is not available for the Standard option. The Standard+ subscription is yearly. Costs are equivalent to GBP currency conversion and therefore may differ on purchase. Extra Vehicle Packs in quantities of ten can be purchased when required at a cost of $16.10 per year (equivalent to £10.00 GBP currency conversion at time of purchase). We can provide the VehicleManagerOnline professional solution on a dedicated server. There are many advatages to a dedicated server and if you want to find out more and the cost then please contact us. SoftwareDotSolutions is based in the United Kingdom. We pride ourselves in delivering online database orientated systems for everyday use. We have worked in large worldwide companies in providing systems and reporting tools for over twenty years. We have a customer first policy and always wish to hear views from our members good or bad on our services. VehicleManagerOnline is our first worldwide Online system. We aim to provide our customers with a free or low cost systems. Please take your time to look around our service and if you have any comments then please do not hesitate to Contact Us, we are always willing and happy to listen to regular or prospective customers. Please fill out the form below and read and confirm that you have read the Terms and Conditions. If you have opted to the purchase the driver feature you will then be directed to our paypal site where the payment plan will be required to complete the setup. Please note the Driver Feature is only enabled for the VMOVisual version of VehicleManagerOnline. *Costs are equivalent to £23.88 GBP currency conversion and therefore may differ on purchase. Please fill out the form below, you will then be directed to our paypal site where the payment plan will be required to be setup. We will contact you about any specific requirements and we will then start to setup your website with the VehicleManagerOnline application. Once we have your order requirements it will take between 24 to 48 hours to setup the system. *Costs are equivalent to either £27.99 GBP per month or £302.29 per year but due to currency conversion may differ on purchase. We have been working hard to produce a new version of the Professional solution of VehicleManagerOnline. There are many new features including setup of users to administer various parts of the solution, document upload process, asset, driver, tyre, accident management and an enhanced reporting system. To coincide with this update we have decided through to the end of September offer a 30% reduction on the normal cost of the professional version. We know it can be difficult to understand if the vehiclemanageronline system will integrate into your work practices. We are therefore very happy to offer you a free 2 months trial on the professional version of vehiclemanageronline. Simply order the monthly or yearly sub-domain version and when you checkout with our paypal account we will apply the trial period. A week before the trial period has finished we will send you an Email. If you have found the system is not suitable for your requirements simply select the unsubsribe button. Alternatively we will also give you the option to upgrade to a full domain. This database is used to collect fuel usage records. The data that can be collected includes the odometer reading, quantity of fuel purchased, fuel cost, purchaser(driver) and any notes about the purchase of the fuel. There is also an option to load Dual Fuel cost and quantity purchased if the vehicle is configured to include this data. The purchaser is not available in the standard version of the VehicleManagerOnline system. The data is viewed and also includes reporting of costs and performance. This database is used to collect service history records. The data that can be collected includes the service item such as cost vehicle servicing, tyres, oil etc. This database is used to collect business travel data. The data that can be collected is business travel information which is ideal if this data needs to be reported for tax purposes. Vehicle Indicators allows the setting up of reminders such as vehicle servicing or tax. Simply anything that you need to be reminded about concerning a vehicle activity. A service type reminder can be setup so the system will predict the future date when the item may occur. If a service item is based on time and distance the system will calculate whichever comes first. The loan type can be enabled to load the service history database automatically keeping a clear record of costs without the need of loading the data all the time. The system will identify up and coming reminders and send an Email when a due date is about to be met. The emails can be sent to a group of addresses. The system can be configured to record and view data based on your country measures such as Miles or Kilometers for the odometer reading. Reported measures such as economy can be configured to what ever is required i.e. Miles per Gallon or Litres per 100 Kilometers. The cost and analysis reporting is very powerful but simple to use. The reporting metrics includes economy measures, cost per day, total costs etc. Reporting is summarised into weekly*, monthly or yearly tracking. Alternatively accounts*, drivers** and vehicles can be compared against the metrics. There is a highlighting system to identify any anomalies. The professional version of VehicleManagerOnline includes the option to save a reporting view. The mass upload process allows you to enter multiple fuel usage and costs records, service history records and business travel details. The process involves completing a downloadable excel template. The template is then submitted to the VehicleManagerOnline system and the data is loaded into the VehicleManagerOnline database ready for viewing. The professional version allows unlimited records to be loaded. For the Standard and Standard+ version up to 200 records can be uploaded at any one time. The datalogger tool has been designed as a WebApp to be used on a smartphone. There is no need to wait to enter data, the datalogger tool enables you to enter fuel usage and costs, service items and business travel whilst on the road. The tool is only for data entry but is very fast which is even ideal to use on the intenet if you just need to enter data into the VehicleManagerOnline databases. The professional and standard+ versions also has a enhanced version of the datalogger tool designed for drivers of your vehicles. The quantity of vehicles that can be loaded into the VehiclceManagerOnline databases is 10 for both the Standard and Standard+ Version. Vehicle packs in quantities of 10 can be further purchased when required. The professional version of the system has unlimited vehicles. In the Standard+ and Professional version the system will allow you to record the driver who purchased the fuel. The Datalogger smartphone WebApp can be assigned to a driver. When they use it to record the fuel usage and costs will also register the driver who loaded data. This data is then reported in the Cost and Analysis Reporting of VehicleManagerOnline allowing comparison to other vehicles and drivers displaying any anomalies. You can manage your drivers so that they can enter data once they have purchased fuel for a vehicle which is loaded directly into the VehicleManagerOnline Databases. The data that is loaded also includes details of the driver who loaded the information. Having your personal website means less contention and less downtime. The website will be personalised to your company livery or colour scheme of your choice. The website will not be search engine indexed ensuring privacy. The professional version includes a dedicated database. Having your personal database means less contention and less downtime. The speed of access will be quicker as you are not sharing with any other users. The dedicate website can be setup to the same livery of your company or to a colour scheme of your choice. We can even add a header banner to the website to make the VehicleManagerOnline unique to your company. The professional version does not display any adverts unlike the standard and standard+ versions. The professional version has an enhanced reporting feature including weekly report. Report on type of fuel usage and service cost breakdown of data. The professional version in the Cost and Performance Reporting allows you to save a reporting view. This can then be recalled at any time ensuring the information is at your finger tips without the need to setup the reporting every time. The professional version allows you to create vehicle accounts. This is ideal if you want to group similar type vehicles and/or depots. User accounts can also be setup for people within your organisation allowing these users to administer different parts of the system and/or vehicle accounts. An admin account is provided which allows creation of the Vehicle and User Accounts. A further enhancement to the Admin Account is that you are able to compare Vehicle Accounts performance. The professional version has an Asset Database. The database can store all the details concerning procurement to disposal of your vehicles. There is a simple filtering system to view the data in various reports and views. The tool can predict when a vehicle replacement will be required and much more. The professional version has a Tyre Management Database. This allows you to collect data concerning tyre performance. The tool will predict when replacement is due either because of life or tread depth. The system can help identify underlying issues on a certain wheel where tyre usage is very high. The professional version has an Accident Management system. This allows you to record and manage inciudents and accidents with your vehicles. Track costs and manage the availability of vehicles. The ability to record details of the thrird party vehicles that were involved. The professional version has a Driver Management database. Keep your relevant drivers details in the system including the identification of the relevant vehicles that they can drive. Record driver medical and license details including the ability to be reminded by Email when a medical activity or license reminder is required. The professional version has a Document Upload process. Scan important documents concerning your vehicle assets, accidents or driver and then upload to the database system. We have integrated a tracker system with one of our user interfaces. The system allows to track all your vehicles current whereabouts, view past journeys of a vehicle and reporting. The current cost of our tracker is £9.99 per vehicle per month(UK Only - Please speak to us if you are outside the UK). The cost includes the supply of a tracker unit, SIM card with data package (note: fair usage does apply and the SIM can only be used with the tracker unit) all you have to do is get the unit installed, full instructions will be supplied. Please enter an Email Address. An order has been sent to the team at VehicleManagerOnline. We are sorry but we had a problem sending the order, please try again in a few moments. Please enter a Contact Name. Please enter a Contact Telphone Number. Match Code is not the same as the Confirmation Code. Please confirm you have read the Terms and Conditions. Please press the confirm button to indicate if you are a member of VehicleManagerOnline.